Reflectors: they are silver, gold, white, striped, some with pink, and all shapes and sizes. Some are double sided or with a 18% gray on the back Then there is the type of surface material itself. Picking what to use appears more complex that it is. 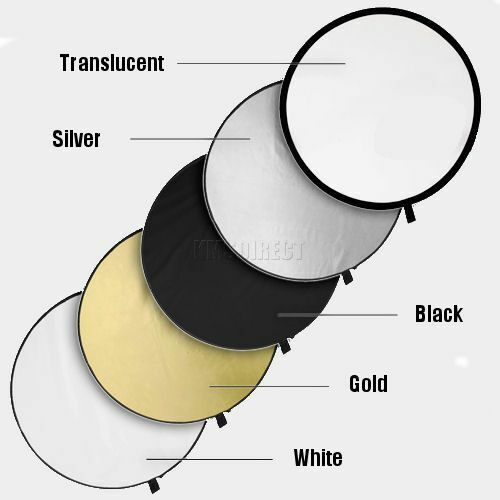 Here are some simple guidelines on selecting and using reflectors. Silver, white or gold? Zebra? Gold is best used outside at sunset or sunrise; it warms up the blue shadow cast. Use it sparingly, from a distance. The gold reflector came into use in the film days, a medium not as sensitive to color shifts as digital. In the studio, it just looks very odd, creating more of a color cast with the fill. Silver gives a sharper, brighter more specular (link this to a blog that explains specular highlights) light. It can easily overpower a soft main light. Great for punchy, edgy, trendy and fashion looks. It is strong, so use it carefully. A great position for it is below the face to fill in shadows and create a nice catch light for a glamour look. White is my favorite. I favor a sheet of foam core for head to toe fill. It gives a very gentle, natural neutral color fill. The closer it gets the broader and softer the fill light is. Some photographers swear by striped reflectors. They were more popular during the film days. My 35 years photographing is showing here. Personally I find them a little gimmicky. If I want a soft reflector, I go for all white, specular then it’s silver. If I want a softer fill I just pull the reflector back. Selecting size. This is pretty easy; the bigger the reflector the bigger the coverage. Resist always reaching for your largest version though. Small reflectors are more surgical. 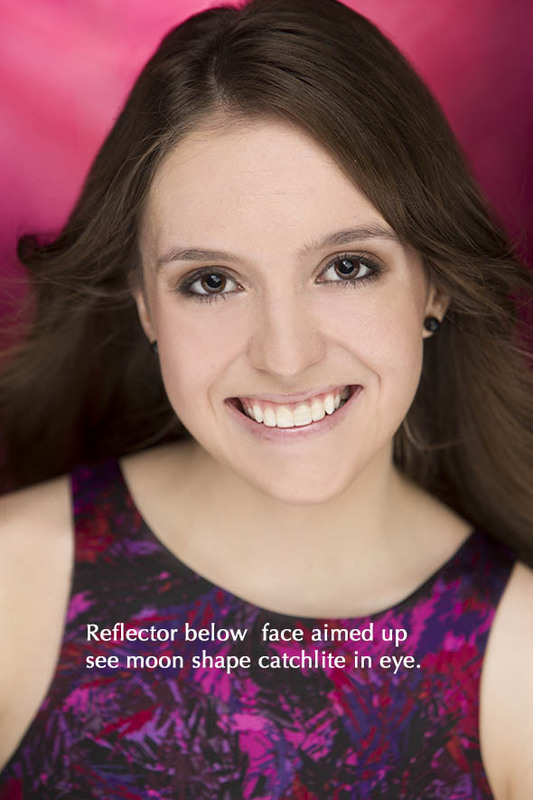 A small reflector can be used to open up a selected area of the subject. The really small ones are usually used in commercial photography for small product fill. Size is not really a key concern. Reflectors are not always used as a fill light; like when working with a reflective surface; mirrors, chrome on bikes and cars, sunglasses. Here the reflector is not really a fill light but a shaping light. When I photograph clients on the Harley I use two 8×6 foot white reflectors wrapping around the side of the bike I am photographing. It does add some fill but its main use is to brighten up the chrome. Rather than the chrome reflecting the black of the floor, the darkened studio or the chaos behind me, it “sees” the white. This gives the chrome a nice clean look. Black sunglasses suddenly have shape and energy. Often forgotten, as a reflector is a mirror. It is pretty strong so it’s a special purpose tool. As a creative choice it is fantastic. Dean Collins, both a master photographer and teacher, once used a 8×4 foot plexi mirror to change the light direction. His assistant went down two blocks to catch the setting sun. Curved the sheet to focus the light then bounced it back to Dean’s subject giving instant warm directional light from the north rather than the west. In smaller pieces the mirror is perfect for placing sharp light in a specific place on your subject. Where to place the reflector? The key here is a bit like playing billiards; the bounce is in the angles. You have to angle the reflector so it can catch the main light source then direct it back into your subject. One of the tricks I use is to have a large scrim in front of my main light. The light is positioned so the light from the scrim falls softly on my subject. The main light is positioned so some of it spills past the scrim, missing the subject but hitting the reflector. This creates a reflection so bright it becomes a second main light. If I adjust the scrim carefully I can have this overspill fall on the reflector but also onto the background. Creating a high key background or a strong cross lit low-key background. Do you have to buy a ready-made reflector? No. I have used white sweaters, blankets, even the reflection of a large white building. Foam core is my most used reflector. Cheap silver versions are the large car window sunscreens. Still, ones created for the industry are very effective. Reflectors are amazing tools that will add dimension to your images at very little cost. Mastering a reflector can save you the cost of an extra light, lighten your gear load all while delivering a stunning image. Once you start using them you will find them indispensible.